The genus Scopulariopsis is a cosmopolitan fungus most frequently isolated from soil and decaying organic material. Scopulariopsis may also be isolated from other substrates including dust, carpets, grain and wallpaper. Spore dispersal is mainly by air. Scopulariopsis generally has a moderately fast growth rate, although some species are slow growing. Colony color can vary from white, tan, brown, to grayish-black. Colony texture can vary from smooth to powdery. Microscopically Scopulariopsis has short, undistinguished conidiophores with annelations. 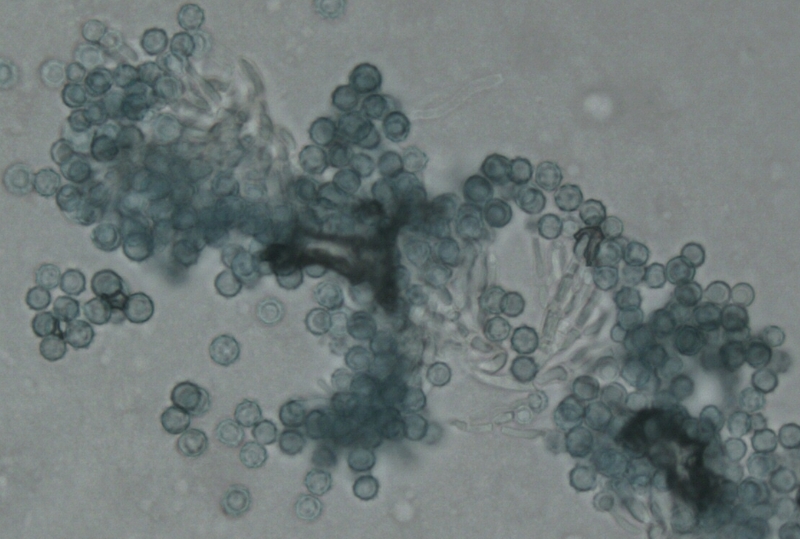 Conidia (spores) are unicellular with a truncate base, produced in chains and can be smooth or roughened. Scopulariopsis is a potential human pathogen and is frequently the cause of onychomycosis. Scopulariopsis species may also be keratinolytic and can cause skin disease. Infection is primarily a problem in immunocompromised individuals.